Mobile phones become thinner and smarter every day. It seems the designer decided to make a strong accent on how contemporary this website is. We would say that it is made in metro style. Flat elements, bright, neon colors, big fonts, HD images every detail is impeccable. Just imagine the powerful affect this website will make on the user. Tabbed navigation in the content area is also a great benefit as lots of customers go no further than the home page. Current, hightech phones look really cool here. There is a space for custom blocks under the content area, which is also a plus as you can post your essential information into the section. Social sharing icons and newsletter subscription are right above the footer. They are marked out with the help of grey color, so visitors will definitely notice them. The footer contains the data users expect to see subsidiary navigation links and company contacts. Do you like what you see? Then, just get this theme and improve your financial state. By using it, you can get a large number of targeted visitors to the internet site from search engines. On-line Chat is a tool that lets you have a live conversation with your clients. It helps you to live chat with site visitors and research visitors' web functions. Anytime you do a search for the theme for your current site you decide on it checking out the demo. All the images, icons and written text is sample data and when you'd like your site look such as the demo - you will need a Sample Data Installer plugin. Sample Data Installer lets adding and activating sample data in a couple of clicks. Bootstrap is especially adaptable for any modification. It's easy to manage with, has a superior grid system and extended components variety. This is an ability of the website to promptly adapt to any display size and resolution. Responsive design makes sure that the website will offer a great viewing experience to all users throughout all devices. Can I put low resolution thumbnails of Electronics Technician PrestaShop themes on my website for my clients to choose designs? Can I contact the Electronics Supplier PrestaShop template author? Yes. You can contact this Electronics Supplier PrestaShop template author/author's team directly using your personal account under the Support tab. Is there any return policy for Electronics News PrestaShop designs? Requests for a refund are accepted at www.template-help.com/tickets within the period of 2 weeks after the order of Electronics News PrestaShop design is placed. You should accompany this request with detailed and grounded reasons why you apply for a refund. Please make sure your request does not contradict the terms and conditions specified in the policy. A refund is issued to you upon receipt of a Waiver of Copyright signed by you. What am I allowed and not allowed to do with the Electronics Company PrestaShop ecommerce themes? You may: Build a website using the PrestaShop template for Electronics Blog in any way you like.You may not:Resell or redistribute templates (like we do).Claim intellectual or exclusive ownership to any of our products, modified or unmodified. All products are property of content providing companies and individuals.Make more than one project using the same template (you have to purchase the same template once more in order to make another project with the same design). Can I customize the Electronics Supplier PrestaShop template if that's required by application settings? Yes, you can customize the Electronics Supplier PrestaShop template code, graphics, fonts to any extent needed. Can I customize the Techno News PrestaShop template? Yes, you can customize the Techno News PrestaShop template to any extent needed. You cannot use a header of the template for one project though, and images from the template for the other project. What is Developers License for PrestaShop design theme for Electronics News? If you purchase a Developer's license, you are granted a non-exclusive permission to use the PrestaShop design theme for Electronics News on up to 5 domains for projects belonging to either you or your client. Are there any discounts if I'm buying over 10, 20, 30 or more Electronics Supplier PrestaShop template? Please email to marketing@templatemonster.com with your inquiries about PrestaShop templates for Electronics Blog. Can I get the PrestaShop template for Digital Electronics in higher resolution to use for printing? 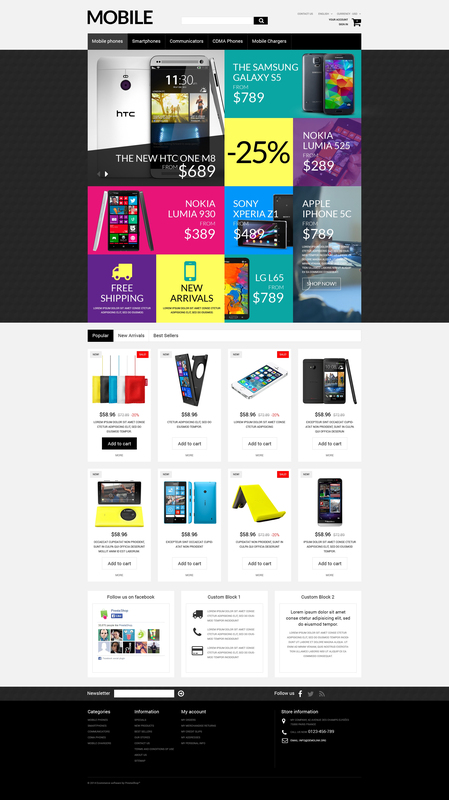 No, we design Electronics PrestaShop themes optimized for web resolution only. Can I put a line at the bottom (or any other spot) of my new product "Website development by Company name" after purchasing Electronics Technician PrestaShop theme? Yes, you can place a note at the bottom (or any other spot) of my product "Website development by Company name". Nevertheless, you cannot place "Website design by Company name" while using one of Electronics Technician PrestaShop theme. How many applications, programs etc can I use to integrate with the PrestaShop design themes for Electronics Repair under one extended license? The extended license gives you the right to use the purchased PrestaShop design themes for Electronics Repair for the integration with one software/freeware/application/CMS/sitebuilder only. In case you would like to use the template with the other application, the other license is to be acquired. What are the advantages of purchasing a PrestaShop ecommerce template for Electronics Repair? The major advantage of purchasing a PrestaShop ecommerce template for Electronics Repair is price: You get a high quality design for just $20-$70. You don't have to hire a web designer or web design studio. Second advantage is time frame: It usually takes 5-15 days for a good designer to produce a web page of such quality. What is the difference between unique and non-unique PrestaShop template for Digital Electronics purchase? Non-unique purchase:Non-exclusive purchase means that other people can buy the PrestaShop template for Digital Electronics you have chosen some time later. Unique purchase:Exclusive purchase guarantees that you are the last person to buy this template. After an exclusive purchase occurs the template is being permanently removed from the sales directory and will never be available to other customers again. Only you and people who bought the template before you will own it. I have customized the Electronics News PrestaShop design and would like to protect my content by copyright, can I place Copyright, Mycompanyname.com? After Electronics News PrestaShop design purchase you can put your copyright to the template. But you cannot place a line at the bottom (or any other spot) of the customized project saying "Website design by Company name". Nevertheless, you can place "Customized by Company name". Can I get the extended license for some other pricing than the half of the initial PrestaShop design theme for Electronics price? No. The price for purchasing license for a single PrestaShop design theme for Electronics is the half of the template unique price. Can I resell the PrestaShop design themes for Electronics Repair I bought the extended license for? No, you cannot resell the PrestaShop design themes for Electronics Repair as is. You can only sell them as the integral part of your new product. I like the image from the Electronics Supplier PrestaShop template and would like to use it for my advertising campaign, can you send me this image in a higher resolution? No, we can't provide image in higher size or resolution rather than it is on the Electronics Supplier PrestaShop template. We recommend looking for professional images on online photo resources. Is it possible to use your Electronics PrestaShop themes to develop websites for my customers? Yes. It is perfect for designers who want to offer their customers a high-quality design and also save time and money. Keep in mind that when you purchase the Electronics PrestaShop design theme with ordinary or exclusive license you're entitled to create only one project (one domain name). Will the Electronics News PrestaShop design be deleted from TemplateMonster database? No, the Electronics News PrestaShop design will not be deleted from TemplateMonster database. Are there any limitations on selling the PrestaShop ecommerce template for Electronics Repair as the integral part of my new product? I ordered a PrestaShop theme for Techno News but haven't received the download information. In case of not receiving the download information of a PrestaShop theme for Techno News, please contact our Billing Department via support chat by phone or e-mail. How can I modify Electronics Blog PrestaShop design theme to suit my particular website? Please visit our Online Help Center to obtain detailed instructions on editing Electronics Blog PrestaShop design theme. What is a unique purchase license for PrestaShop design theme for Electronics Lab? If you purchase the product at a 'Unique price' it guarantees that you are the first and the last person to buy this PrestaShop design theme for Electronics Lab from us. It means that this template has not been sold before and you become an owner of a unique design. After this kind of purchase the template is being permanently removed from our sales directory and is never available to other customers again. The unique purchase license allows you to develop the unlimited number of projects based on this template, but the template should be customized differently for every project. What is the price for acquiring the extended license for Techno News PrestaShop template? There is no set price for acquiring the extended license. The price is based on the Techno News PrestaShop template's unique price for those templates you would like to use for the integration. The price for purchasing license for a single template is half of the template unique price. Can I resell PrestaShop themes for Digital Electronics I bought the developers license for? You cannot resell the customized PrestaShop design theme for Electronics Lab as a template, but you may sell it as a project to your client. This template is really done well. Very simple to develop and intuitive in navigation. Even if we talk about a template compatible with version 1.6 it is certainly an excellent purchase. About the, Handheld Devices PrestaShop Theme . It is possible to convert this into a classified mobile phones website ?